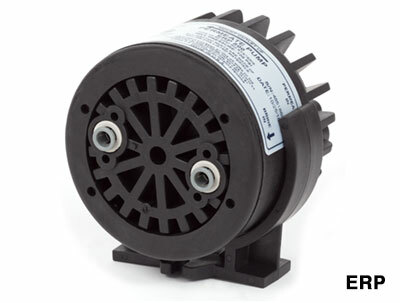 Aquatec’s unique permeate pump (ERP1000) is a simple, yet revolutionary, device. Powered only by the hydraulic energy of brine water usually lost to the drain (no electricity required), the permeate pump forces product water into the storage tank, reducing membrane back pressure and maximizing available feed pressure. These pumps dramatically improve the efficiency of reverse osmosis water (RO) production, reducing wastewater by up to 80%. The permeate pump can also bring storage tanks up to line pressure and then shut the system down when these tanks reach capacity, eliminating the need for a hydraulic shut-off valve. Other benefits include higher delivery pressures, faster RO water production, superior water quality, and extended filter/membrane life. The ERP-500 is specifically designed for residential applications (less than 50 GPD) where overall system noise is a key concern. Includes a specially designed insert which helps the system operate in near silence, eliminating the occasional clicking or gurgling sounds that can otherwise occur. Both the ERP1000 and the ERP500 can easily be retrofitted to upgrade existing RO systems.